I chose this particular sailing because the price was decent, the timing was right for my schedule, and because I hadn&apos;t cruised to Alaska in over 20 years and why not now? It was the first time in over 15 years that I flew directly to join a cruise, and I wished I had flown west earlier because the jetlag bothered me for the first couple of days. The entire process of transfer and boarding was extremely efficient. It&apos;s a bit of a hike from the terminal at SeaTac airport to the boarding area for cruise transfers, but Princess staff were available everywhere to help and direct us. Once I reached the boarding area, I was called to board a bus in less than ten minutes. At the pier, the process was also super-swift for Elite and Platinum customers, and I was actually into my stateroom before the time advertised when boarding would begin. The benefits of sticking to one cruise line certainly paid off! I had previously sailed on Caribbean Princess, and found that this near-sister ship was similar-to-identical in most areas. It was easy to find my way around right from boarding. Also my stateroom was identical to the one I had occupied on Caribbean Princess -- except that this ship is now equipped with the super-comfortable new deluxe beds which Princess is rolling out across its fleet. My cabin steward, Marlon, quickly remembered my name and gave all sorts of little extra touches of help beyond what I had previously seen -- like carrying in my big bag for me, and running an extra trip when I fell asleep and missed the delivery of the daily ice bucket. One of my favourite features of this ship is the promenade which circles the entire ship from bow to stern. I got in some good long walks on that deck during sea days, and there are also old-fashioned wooden deck chairs with cushions which are great for sitting on if you don&apos;t want to be out in the direct sun. Meals: food in the Horizon Court buffet was even more varied than on previous cruises, with a much wider assortment of dishes from meal to meal. I ended up eating the majority of my meals there. Service for drinks was always prompt and available, as was help finding a vacant seat or table at busy times. I had dinner two nights in the main dining room, and service was adequate but rather cold and unfriendly on the first night. The second occasion was much friendlier. The menus contained many familiar dishes from previous cruises, but also some fresh Alaskan seafood which added a welcome variation. The specialty restaurants were a big letdown. First, this ship does not offer the specialty Italian restaurant, Sabatini&apos;s. I missed that one big time. I dined at the Crown Grill steak house, and the service was appalling. On other Princess ships this has always been a relaxing experience, but here the servers were actually running to try to keep up because they were so short staffed. They certainly did the best they could, but the shortage meant that I had to wait a total of 20 minutes before I received my drink and ordered my meal. the great race kept up until just as I was digging into my steak when a whole crew of extra people suddenly materialized and things calmed down. The food was excellent, the disorganized service anything but. NOT impressed. I didn&apos;t attend any of the big shows but certainly enjoyed the lighter musical entertainment in the Piazza, and in the Wheelhouse Bar. The bar servers in the Wheelhouse were right on top of their game, always close at hand when you needed a refill or had a question. Same was true of the deck waiters on the topside Lido and Sun decks. 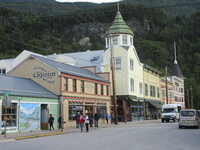 Port calls in Juneau and Skagway were standard, and I thoroughly enjoyed both the whale watching cruise in Juneau and the White Pass rail excursion in Skagway. The scenery along the rail line is monumental, but the experience means even more if you read up ahead of time about the gold rush -- you&apos;ll get far more out of that port when you know more about the events than the tour guides have time to give you. Our day in Glacier Bay was phenomenal with blazing sunshine and still air so that the bay was like glass. The naturalist on board gave detailed explanations over the sound system as we stood on deck watching the huge glaciers. 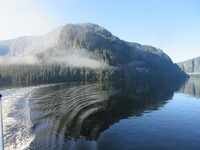 Similar weather conditions prevailed on the Misty Fjords boat tour out of Ketchikan, where clear weather is almost never seen. Incredible luck there. I also greatly enjoyed the talk about the traditional lifestyle and social systems of the First Nations, given by an elder and artist who sailed on the Misty Fjords tour with us. The drawbacks: Princess is determined to include a port call at Victoria on their 7-day Alaskan itinerary out of Seattle. To do this, they have to give only 5 hours ashore at Ketchikan and 5 hours in the evening at Victoria. That&apos;s selling both places incredibly short. They should just do the sensible thing and run the cruise as an 8-day voyage, rather than 7 days, with a full day at each port. 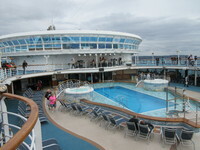 The Alaskan cruise was an amazing experience, and one everyone should do. But I don&apos;t think I would choose to sail on Ruby Princess again without some assurance that the bumps in the dining and restaurant service were ironed out and brought up to the line&apos;s standards. Sailaway party on the top decks as we left Seattle. Early morning cruising into Glacier Bay. 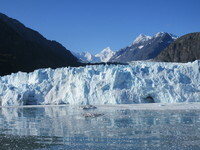 Margerie Glacier in Glacier Bay. Ruby Princess docked in Ketchikan. I chose this particular sailing because the price was decent, the timing was right for my schedule, and because I hadn&apos;t cruised to Alaska in over 20 years and why not now? It was the first time in over 15 years that I flew directly to join a cruise, and I wished I had flown west earlier because the jetlag bothered me for the first couple of days. The entire process of transfer and boarding was extremely efficient. It&apos;s a bit of a hike from the terminal at SeaTac airport to the boarding area for cruise transfers, but Princess staff were available everywhere to help and direct us. Once I reached the boarding area, I was called to board a bus in less than ten minutes. At the pier, the process was also super-swift for Elite and Platinum customers, and I was actually into my stateroom before the time advertised when boarding would begin. The benefits of sticking to one cruise line certainly paid off! I had previously sailed on Caribbean Princess, and found that this near-sister ship was similar-to-identical in most areas. It was easy to find my way around right from boarding. Also my stateroom was identical to the one I had occupied on Caribbean Princess -- except that this ship is now equipped with the super-comfortable new deluxe beds which Princess is rolling out across its fleet. My cabin steward, Marlon, quickly remembered my name and gave all sorts of little extra touches of help beyond what I had previously seen -- like carrying in my big bag for me, and running an extra trip when I fell asleep and missed the delivery of the daily ice bucket. One of my favourite features of this ship is the promenade which circles the entire ship from bow to stern. I got in some good long walks on that deck during sea days, and there are also old-fashioned wooden deck chairs with cushions which are great for sitting on if you don&apos;t want to be out in the direct sun. Meals: food in the Horizon Court buffet was even more varied than on previous cruises, with a much wider assortment of dishes from meal to meal. I ended up eating the majority of my meals there. Service for drinks was always prompt and available, as was help finding a vacant seat or table at busy times. I had dinner two nights in the main dining room, and service was adequate but rather cold and unfriendly on the first night. The second occasion was much friendlier. The menus contained many familiar dishes from previous cruises, but also some fresh Alaskan seafood which added a welcome variation. The specialty restaurants were a big letdown. First, this ship does not offer the specialty Italian restaurant, Sabatini&apos;s. I missed that one big time. I dined at the Crown Grill steak house, and the service was appalling. On other Princess ships this has always been a relaxing experience, but here the servers were actually running to try to keep up because they were so short staffed. They certainly did the best they could, but the shortage meant that I had to wait a total of 20 minutes before I received my drink and ordered my meal. the great race kept up until just as I was digging into my steak when a whole crew of extra people suddenly materialized and things calmed down. The food was excellent, the disorganized service anything but. NOT impressed. I didn&apos;t attend any of the big shows but certainly enjoyed the lighter musical entertainment in the Piazza, and in the Wheelhouse Bar. The bar servers in the Wheelhouse were right on top of their game, always close at hand when you needed a refill or had a question. Same was true of the deck waiters on the topside Lido and Sun decks. Port calls in Juneau and Skagway were standard, and I thoroughly enjoyed both the whale watching cruise in Juneau and the White Pass rail excursion in Skagway. The scenery along the rail line is monumental, but the experience means even more if you read up ahead of time about the gold rush -- you&apos;ll get far more out of that port when you know more about the events than the tour guides have time to give you. 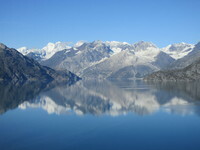 Our day in Glacier Bay was phenomenal with blazing sunshine and still air so that the bay was like glass. The naturalist on board gave detailed explanations over the sound system as we stood on deck watching the huge glaciers. Similar weather conditions prevailed on the Misty Fjords boat tour out of Ketchikan, where clear weather is almost never seen. Incredible luck there. I also greatly enjoyed the talk about the traditional lifestyle and social systems of the First Nations, given by an elder and artist who sailed on the Misty Fjords tour with us. The drawbacks: Princess is determined to include a port call at Victoria on their 7-day Alaskan itinerary out of Seattle. 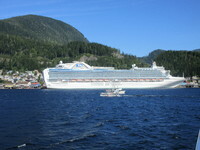 To do this, they have to give only 5 hours ashore at Ketchikan and 5 hours in the evening at Victoria. That&apos;s selling both places incredibly short. They should just do the sensible thing and run the cruise as an 8-day voyage, rather than 7 days, with a full day at each port. The Alaskan cruise was an amazing experience, and one everyone should do. But I don&apos;t think I would choose to sail on Ruby Princess again without some assurance that the bumps in the dining and restaurant service were ironed out and brought up to the line&apos;s standards. The mini-suite isn&apos;t huge, but it is neatly organized so that there is room to move around and plenty of drawers and shelves to store things. The walk-in closet area is spacious, and there were plenty of hangars for clothes. The balcony is a good size, with two reclining chairs and two footstools as well as a table. The bed is the new Luxury Bed which is gradually being added on every ship in the fleet. This new bed is a real winner! I have never slept as well on a cruise ship before! For my money this mini-suite is worth the extra cost, not least for the larger bathroom which has enough space to step in and out without hitting something, thanks to a full bathtub. It&apos;s an awesome experience to see the glaciers up close. No excursions offered and none needed. A minor detail: coffee and such are only available in mugs as disposable cups, lids, straws and so on are banned in Glacier Bay. The boat operator guaranteed us a whale sighting and we did see two, as well as a sizable colony of sea lions. The included stop at the Mendenhall Glacier on the way back was a washout due to pouring rain, a common hazard in Juneau. The tour bus was VERY uncomfortable with too many rows of seats crammed in. Beautiful large vessel, plenty of comfortable seating, a smooth ride, amazing scenery, good commentary and a fascinating talk from a First Nations elder and artist on the return voyage. An included cup of soup and smoked salmon nibble was a welcome addition, as was the free coffee/tea. Highly recommended! Boarding and debarking were both very smooth and efficient. No complaints here. A spectacular and thrilling ride with incredible scenery and plenty of history and information from the on-board guides. The port call was too late at night and too short to make going ashore worthwhile (we docked in Victoria from 7:00pm to midnight).